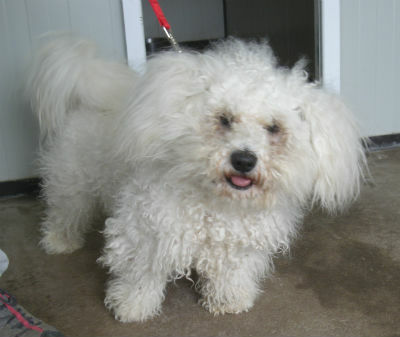 A young Bichon Frise arrived at Margaret Green Animal Rescue’s Lincoln Farm Centre, just outside of Bere Regis, as a stray. He had the worst matted coat the staff had ever seen. They acted quickly to get the neglected dog to the vet. “His matts were so thick and tight to the skin that he required sedation to have them shaved off because of the distress it would have caused him had he been awake”, says Helen Chittock, manager of Lincoln Farm. “They were so painful that the vet was unable to check his ear and eye general health until they were removed”. The dog, re-named “Lucky” by staff after his coat was removed, transformed very quickly into a much more sociable and playful boy. 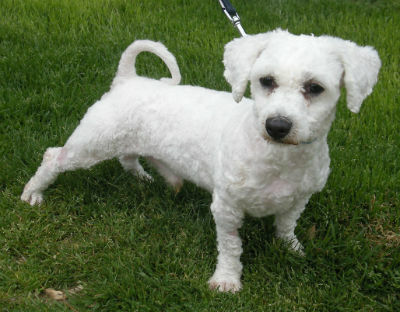 “As soon as they were gone he was very happy and able to run around much more freely. He became quite the character, a real cheeky chap who was very affectionate but equally loved to hare about with a tennis ball and his doggy pals”. It wasn’t long before Mr and Mrs Carr came down from Sherborne. They were looking to adopt a dog and fell in love with Lucky’s charm! After passing their home check, they took Lucky home to live. “He was a bit cautious to begin with but soon settled in” Says Mrs Carr. 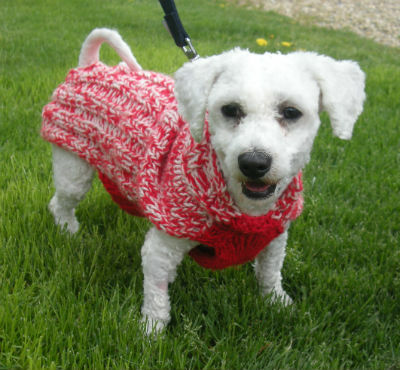 “He now has a lovely white coat which everyone they meet always comments on. He loves going in the river for a swim with the other dogs and will go in where the water reaches the tops of his legs. He loves baths and being groomed, he gets on great with other dogs and is totally in love with us! We love him dearly”.